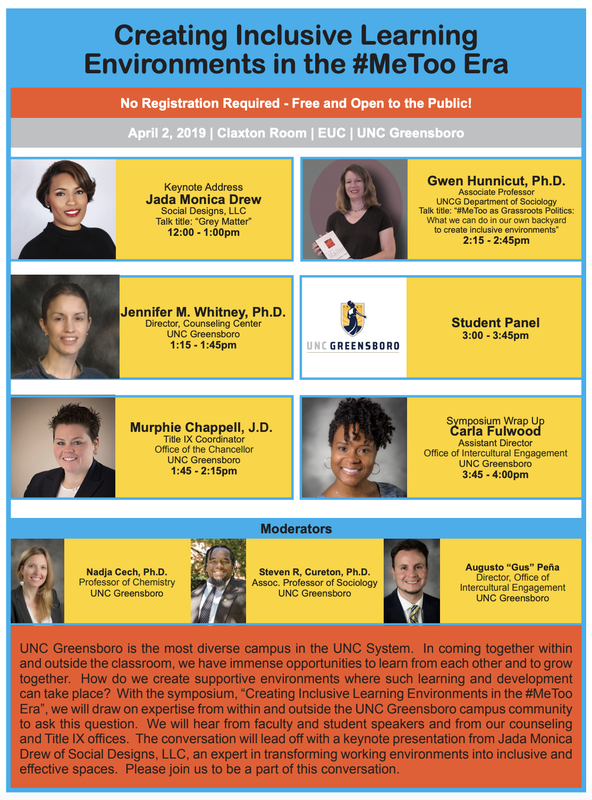 We in the UNCG College of Arts and Sciences seek to create a maximally diverse and inclusive community. Diversity promotes academic excellence by inspiring creativity and innovation and challenges us to stretch, learn, and grow. As one mechanism towards the goal of increasing the diversity of our faculty, this document outlines steps that search committees in the College of Arts and Sciences can take as part of the recruitment process. Additionally, search committee members are welcome to seek input or advice from members of the Diversity Committee or the Dean’s office staff in the College of Arts and Sciences at any time in the search process. When defining the area of academic specialization for the ad, consider that certain areas may be more appealing to candidates from underrepresented groups than others. Request a diversity statement from the candidate. This statement might ask candidates to reflect on how they understand diversity and/or how they see their work as contributing to diversity. Include wording in the ad that reflects the UNCG and CAS commitment to diversity. Suggested language will be included in search documents provided by CAS at the beginning of search process, such as the statement below:UNCG is located in a metropolitan area of more than 1.6 million in the Piedmont region of North Carolina, between the Atlantic Ocean and the Appalachian Mountains. Our institution fosters an environment of collaboration across departments and schools and supports community-engaged research. We are a Minority Serving Institution, with an undergraduate population that includes 50% white, 28% Black or African American, and 8% Hispanic or Latino American students. In addition, many of our students are first generation college students or international students. These are just a few examples of the many ways in which diversity is reflected in our campus community. We are proud of this diversity, and have a strong commitment to increasing and promoting diversity and inclusiveness among our faculty, staff, and students. UNCG is an EEO/Affirmative Action/M/F/D/V employer. New faculty members may contribute to the diversity of the department in multiple ways. Three examples are given here. Many candidates may contribute in more than one way. By increasing the representation of historically underrepresented groups in the faulty (for example, hiring women in STEM fields or faculty from ethnic groups that are currently underrepresented in a given discipline). By engaging in scholarship related to diversity and inclusiveness. By having particular skills or a commitment to mentoring students, including those from vulnerable populations such as first-generation college students, or those from underrepresented groups. Actively seek applicants from underrepresented groups, rather than rely upon existing networks. Reach out to colleagues, departments, and universities who have a track record for training individuals from groups who have historically been underrepresented in specific academic disciplines. Use social media in a targeted manner to reach out to diverse populations. Contact task forces and interest groups that represent the needs of underrepresented groups within professional organizations. Choose multiple criteria on which to evaluate candidates and come to agreement within the committee on these criteria in advance of reviewing applicants. Consider the various ways in which the candidate might contribute to diversity and inclusiveness when defining these criteria. To become more aware of biases you may have in your notions of what an ideal colleague looks like, it is helpful to take bias tests such as those recommended by the Provost’s office. Awareness of potential biases may be helpful in efforts to give all candidates full and fair evaluation. Take time to review the applicants (based on the parameters defined prior to the search) to avoid the tendency to quickly eliminate candidates solely based on superficial characteristics, such as the prestige of the institution where they were trained. In reviewing an applicant, ask yourself and your colleagues, how would this candidate best serve our students? Carefully consider inputs from our students in searches. What is the value of diversity in a higher education community? How does your research, teaching and/or community service promote diversity? How do you define diversity and inclusiveness? UNCG is a minority serving institution and our student population is comprised of individuals from diverse backgrounds, including many first-generation college students. Can you describe your experience or interest working with students from diverse backgrounds? As part of the interview schedule, organize meetings with colleagues and students who may be particularly able to speak to the importance of diversity on the campus and the campus environment for fostering diversity. These might be individuals outside of the specific academic department conducting the search. Here we provide an example list of campus contacts. Seek to engage the candidates with in-depth discussions about the importance of diversity, using comparable questions to those posed in the preliminary interviews, as appropriate. Alianza, UNCG Latino Faculty/Staff Association. Contact: Estela Ratliff, Alianza board chair for 2016-17, by phone at 336-334-3230 or email at eyratlif@uncg.edu. In preparing the list of candidates to present to the dean, departments are required to include a summary of how diversity was considered in the search process and how the various candidates will contribute to/enhance the diversity of the faculty.